How to get to Hotel Cuna del Angel? 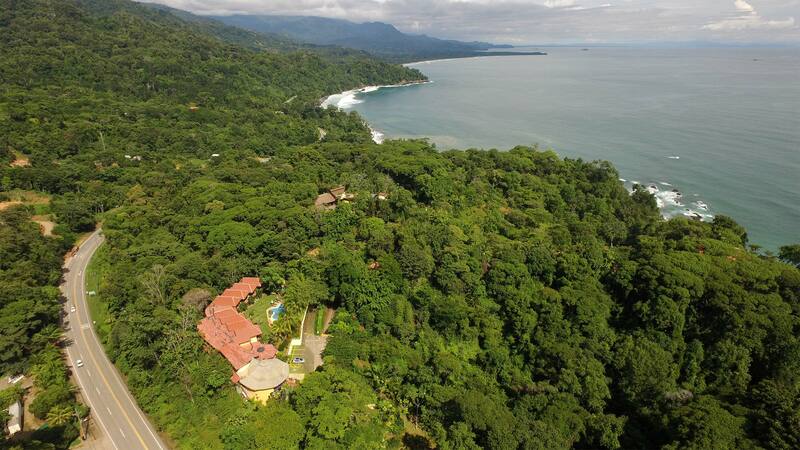 Cuna del Angel is located 9 km / 4.5 milles south from Dominical Beach, entrance to Puertocito; and 9 km north from Uvita, the main entrance to Ballena National Marine Park. We can help you to rent a car or arrange private transportation to get here. If you decide to drive, take this trip as a tour, and try to drive during daytime to enjoy the view. The trip extension will depends on the route and transportation you choose. This is the most reccomended route for its easy access and excellent conditions of the road, all it is paved and plain topography. This trip could take 3:30 hours. At the moment you leave San José, be sure to take route #27, follow the signs towards Orotina for 54km/34miles, (you will pass by Escazú, Santa Ana, Ciudad Colón, Turrúcares, Atenas and Orotina). When you get to Orotina´s toll booth, pay attention to the signs indicating the turnoff on your right to take route #34 towards Jacó, Parrita and Quepos. This way from San José to Quepos could take 2 hours approx. Once you are in Quepos, follow the signs that lead you to Dominical Beach for 43 km. To reach Hotel Cuna del Angel you must keep driving passing the police control and Baru River bridge. Our hotel is located 9km / 4,5miles south of Dominical Beach, you will see the entrance to Puertocito on the right side of the road and our sign above the entrance. ¡Welcome! This is the faster way to get here. If you start your trip from the Juan Santamaría International Airprot be sure the car rental company provides you with good instructions. From San José take the Pan-American Highway towards Cartago where the scenic mountains along the Road #2 will welcome and lead you to San Isidro del General. After 120 km/ 60 miles (about 3 hours driving) through the mountains you will arrive to San Isidro, make a right at McDonnald sign and follow the street that will end it up at the road to Dominical. After 37 km/ 23 miles (about 45 minutes driving time), the road ends and you will have two choices: right towards Manuel Antonio, or left toward Domincal and Hotel Cuna del Angel. Make a left and pass the Police Control and Baru Rive bridge, keep going 9km/ 4,5 miles you will see the entrance of Puertocito on the right side of the road. Our sing is above the entrance. The road is all paved and in very good shape. We recommend to drive on this road during the day to avoid rain or fog. Total time: 4 1/2 hours. If you start your trip from the Juan Santamaría International Airport be sure the car rental company provides you with good instructions about how to leave San Jose towards Cartago, that can be the difficult part of the trip. If you prefer we can arrange private transportation and you can have a car rental waiting for you at your arrival in our hotel. Ask about rates and avaialbility. The fastest way to get here is by domestic airlines. There are two local airlines: Sansa (www.flysansa.com) and Nature Air (www.natureair.com). The flight takes about 45 minutes and it is a great opportunity to enjoy the view of mountains and coastline from the air. Both companies operate the flight with small planes one or two engines. Be sure to check the maximum luggage allowed to avoid problems. You can fly to Quepos where there are more daily flights, using Sansa www.flysansa.com or Nature Air www.natureair.com. The flight takes about 30 minutes, and there are flights from morning to afternoon. The driving to Dominical is about 43 km / 28 miles long through an excellent conditions road. The trip takes about 45 minutes. If is necessary, our reservations department can help you to arrange a car rental that will be waiting for you at your arrival or private transportation, ask for availability and prices. At the moment you leave Quepo´s air strip turn left (South), drive on this straight road for 43 km / 28 miles to Dominical Beach. To reach Hotel Cuna del Angel you must keep driving passing the police control and Baru River bridge. Our hotel is located 9km / 4,5miles south of Dominical Beach, you will see the entrance to Puertocito on the right side of the road and our sign above the entrance. ¡Welcome! There are two local airlines: Sansa (www.flysansa.com) and Nature Air (www.natureair.com). The flight takes about 45 minutes and it is a great opportunity to enjoy the view of mountains and coastline from the air. Once you land on Palmar Sur the driving takes about 50 minutes to our hotel. We can help you to arrange a car rental that will be waiting for you at your arrival or a private transportation, ask for availability and prices. The road is all paved. Once you leave Palmar Sur make left toward the Térraba River bridge. Pass the bridge and you will find an intersection, take a left following signs to Dominical. The road is in very good shape and offer beautiful views with mountains on the right side of the road and ocean on the left side. When you arrive to Uvita you are only 4.5 miles/ 9km away from Cuna del Angel. You will see a bus stop on the right side where says “Puerto Nuevo” and 50 meters after our sign, slow down and make left in the next entrance.